Protests Against Obamacare being held this week – Update X2 (New Pics and video) | can i just finish my waffle? Scroll to the bottom for video and updates from St. Louis yesterday. While you cannot depend on regular news sources to tell you about what is happening, there are protests across America in opposition to Obamacare. Here are just a few examples. Today, Obama is scheduled to appear in St. Louis, and this event has been closed to the public. (I am watching him now in Washington, D. C. introducing the president of Haiti, so I supposed he is still going to St. Louis, or not?) It is later this evening and I guess it doesn’t take long to get there on Air Force One. There are protests scheduled in St. Louis for today. Below is a video of a rally which was on Monday, I believe, from North Carolina protesting in front of the office of Kay Hagan, (D) N. C. Senator. This is likely representative of other locations, so all is not as cheery as they want us to believe. UPDATE 1: From Michele Malkin: Large crowd of about 2000 people were at the morning protest in St. Louis., actually St. Charles I believe it is. See some great pictures Here. 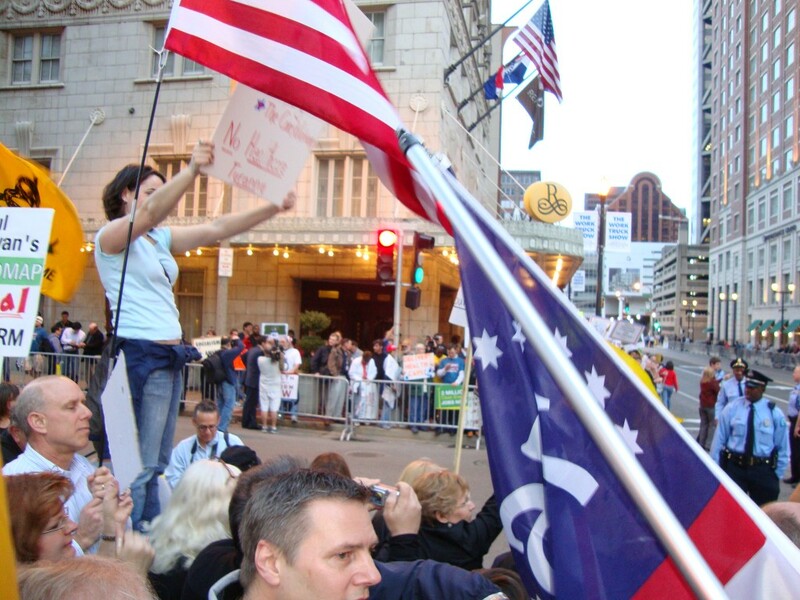 UPDATE 2: Tea Party welcomes Obama to St. Louis yesterday/last night!! See “2300 Greet Obama at St. Louis Fundraiser”. There are lots of young people in this movement. Just check out the pictures. Huge array of pictures Here. Posted: 03.10.10 Updated: Yesterday and 03.11.10 @ 11:45 a.m.